I volunteered to help the Kids Adopt-A-Beach Cleanup at Dock Weiler Beach. There were over 2,000 kids carrying plastic bags and wearing green gloves to pick up trash on the beach. 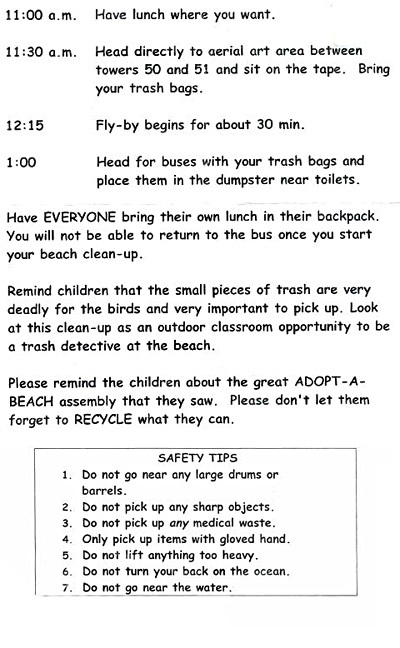 While performing this duty, I realized that the majority of the trash on the beach that day was actually from the “Clean Up.” I did my best with the time I had, but I wonder if they should schedule an entire cleanup crew just to clean up after the original cleanup crew. Most of the kids trash bags were filled with the trash generated from their lunch on the beach.